Factory production of prefabricated wooden element houses is the main activity of Q-Haus Baltic, but the company also produces prefabricated modules for apartment buildings. All the prefabricated wooden houses are tailored. Q-Haus was established in 2004. It now exports over 50 wooden houses per year and the turnover is about 4 million euros. The factory uses Finnish, Swedish, Russian and Estonian wood in its products. 98 per cent of production is exported and most of the houses are erected in Northern Norway. Sweden is a fast growing market, and other exporting countries are Germany, Denmark and the UK. “The secret of our success in exports is that we are young and we try very hard to be better”, says Andrea Bronzini, Sales Director and Chief R&D Engineer. The headquarters of Q-Haus are situated in Tallinn, where 17 engineers do the designing work. The factory premises are in Jõelähtme, a 25-minute drive from the office. The factory employs an average of 25–30 workers who deal with the production of timber frame elements and logistics. ”The average age of our office employees is just above 30 years. We are young and multinational, and our working language in the office is English”, says Reino Soots, CEO. Whatever the product, Q-Haus aims for high quality, energy saving and absolute customer satisfaction. Good planning saves time and makes for better quality. This type of element building minimizes the amount of mistakes in the building phase. Building with elements is much faster than traditional building. Q-Haus can make an energy efficient house in just 5–6 months. The engineering design, that includes construction drawings and production drawings, takes about 6–10 weeks. When the designs are agreed on, all the elements and parts are manufactured in Estonia in 3–10 days. They are then delivered to building sites abroad in weatherproof packages in just a few days. 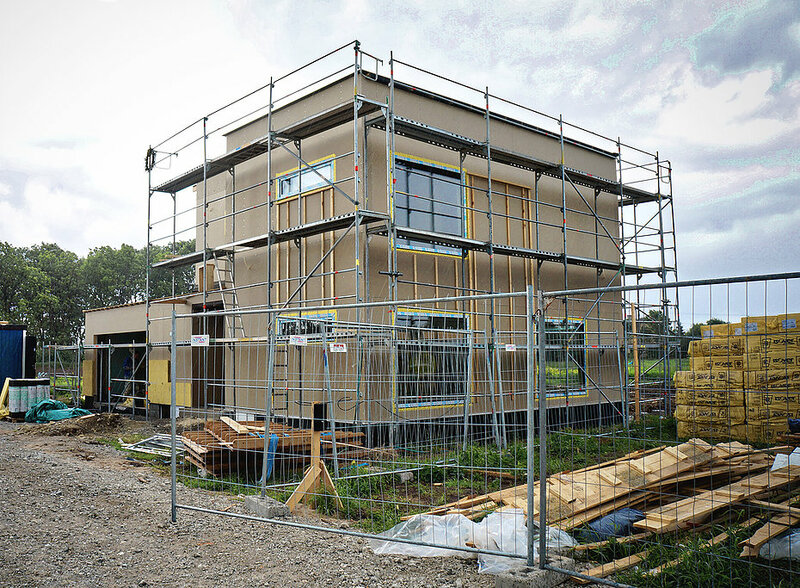 The elements are assembled on site in 3–6 days with an Estonian assembly team, and the external finish work takes about 2–3 weeks. The clients do the internal finish and technical work. The company’s sales have almost doubled in two years, and Q-Haus will have to expand their premises. Now they have two production halls where wood is cut semi automatically. “This is one of the reasons we chose Vertex: we wanted to upgrade our machine to fully automated wood-cutting. We want to be able to mark the pieces and speed up the production. Our plan is to use Vertex in the design phase and to link the information directly to the saw”, Bronzini says. So far Q-Haus has been using Vertex for production drawings and for sales estimations, extracting all the quantities from the Vertex models and making offers based on them. “Because all our houses are different, this used to take a considerable amount of time. Previously we used to do the designs with other CAD software. After designing you had to measure and write things down, which was time-consuming. 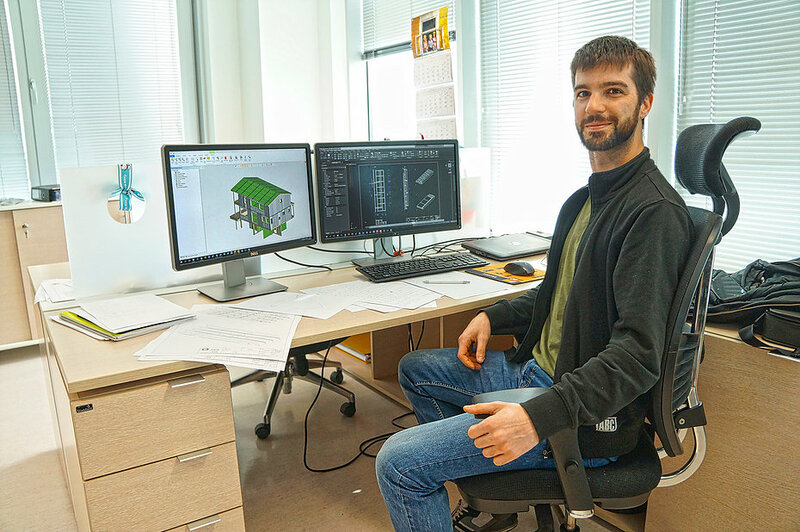 When we started using Vertex, we could see improvement in that”, Bronzini says. Last year, Q-Haus developed their own ERP system, and it is run with tablets. Material listings for ERP are provided by Vertex BD software. “Everything in the factory goes through the ERP, so we are monitoring the production elements in real time. We can basically see what is being produced and which layer in each element is currently under production”, Bronzini explains. Each work station has a tablet. The production staff uses them to inform the office which layer they are working on. The office tracks the time so they know when they start and finish with a layer. Q-Haus has ISO certifications for quality and environmental management. Every product and component they use has a CE mark, which is necessary for the ETA approval. The company also has the Passive House Consultant Certificate.